technology partners, and other allied organizations. and ACPA members. Content editing is reserved for ACPA members. Contact Eric Ferrebee for access. Thank you 2018/19 ACPA Sponsors! Concrete pavements utilize cement to create a rigid surface which can be used for numerous applications. 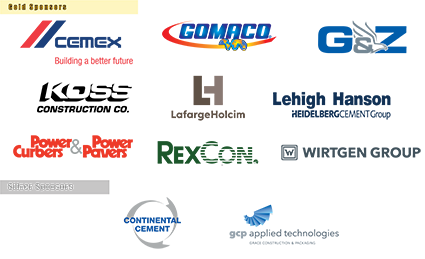 The most common applications are highways, streets, roadways, airports, industrial sites, and parking facilities. 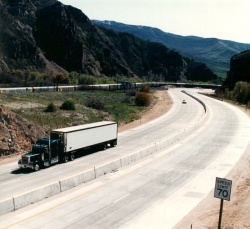 Due to the concrete's rigidity, concrete pavements distribute applied loads over a wide influence area. The most common types of concrete pavement are jointed plain concrete pavement (JPCP), jointed reinforced concrete pavement (JRCP), and continuously reinforced concrete pavement (CRCP). The main difference that distinguishes between these three systems is the jointing system used to control crack development and transfer load. Additionally, pervious concrete pavement and roller-compacted concrete (RCC) pavement have been gaining popularity in recent years. These two types of concrete pavement utilize optimized mixes and construction methods to achieve different properties than the three more traditional types of concrete pavement. These typically behave as undowelled jointed plain concrete pavements which rely on aggregate interlock and subgrade support to transfer the load between slabs. 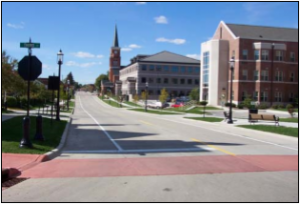 The use of decorative concrete has increased dramatically in the last few years, especially for urban streetscape programs intended to revitalize downtown areas in small- and medium-sized towns and cities. A common location for decorative (stamped and/or colored) concrete in roadway pavements is at crosswalks. The colored concrete can help serve as a pavement marking if the standard white stripes identifying the crosswalk wear off. The colored crosswalk still alerts pedestrians and motorists of the crossing, making for safer pedestrian/vehicle intersections. To view the rest of this page, click here. Dowel baskets can be placed for paving using baskets before paving begins or using a dowel bar inserter as paving is taking place. 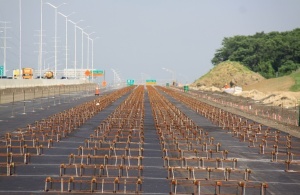 In this photo dowel have been placed with baskets and have been placed only in the wheel paths. This can result in cost savings by eliminating dowels without impacting long-term performance. Dowel bars are used to transfer the load at the joints from one slab to the next and are an important part of the joint mechanics of jointed plain concrete pavement (JPCP). This page was last edited on 21 September 2018, at 15:19.